The campaign has dropped the pictures after it was accused of “sexualising” children. The artwork from the road safety book. 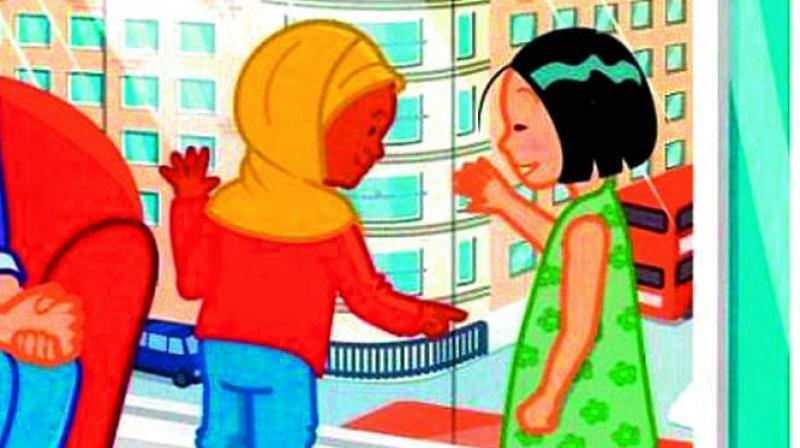 London: A road safety campaign in the UK that uses images of a young cartoon character wearing a hijab has dropped the pictures after it was accused of “sexualising” children. The £2 million campaign, promoted by Transport for London (TfL), includes children’s books distributed in nurseries as well as an interactive website. The stories are illustrated with characters from ethnically diverse backgrounds. The Muslim girl, aged three or four, is called Razmi and always shown wearing a religious headscarf. Razmi is seen indoors in the home of a Chinese girl and that child’s grandmother and on outings, The Times reported. TfL, which is chaired by Sadiq Khan, the capital’s Labour mayor, has apologised and said that it would stop using the images, the report said. Gina Khan, an advocate of Islamic women’s equality, was quoted as saying, “You are sexualising a four-year-old girl. It is as simple as that.” Aisha Ali-Khan, a Muslim feminist campaigner, said the publishers of the book need diversity training.